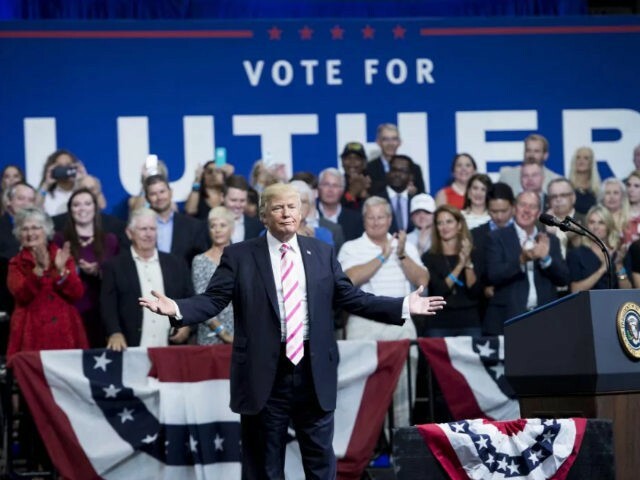 If Sen. Luther Strange (R-AL) was hoping for a full-throated, straightforward endorsement from President Trump, he will have been disappointed with the somewhat tortured thumbs-up he received from the president at a rally in Huntsville, Alabama, on Friday night. Strange, the establishment favorite in the Alabama Senate primary, is trailing in multiple polls to conservative opponent Judge Roy Moore and has clung to Trump’s endorsement as he seeks to sell himself as a candidate who will help drain the swamp and help Trump pass his agenda in Congress. Yet Strange’s history as a D.C. lobbyist, his wobbly stance on DACA, and his big-money backing by the establishment GOP has not warmed him to deep-red Alabama Republicans, and he needed a big win from Trump on Friday to get him back on track. But while Trump praised Strange as a “real fighter and a real good guy” and a “tough cookie” who “doesn’t deal and kowtow to anyone,” Trump also admitted he may have made a mistake getting involved in the race. He noted Strange’s significant lead in the polls, and that the media would cast it as an “embarrassment” for Trump if he were unable to pull his candidate over the line. In another blow for Strange, Trump mulled the possibility of a Moore victory and said he would campaign for Moore, as well, if he were to win the primary. “By the way, both good men and you know what, I told Luther … if his opponent wins, I’m going to be here campaigning like hell for him,” he said to applause from the crowd, although he later argued that while he believed Strange could win the general election, Moore could not. He also noted that Strange had been harmed by being appointed to succeed Attorney General Jeff Sessions. “The fact that he was appointed hurt him,” Trump said. “He’s not a friend of Mitch McConnell. … He doesn’t know him; he just got [to the Senate],” Trump told the crowd. However, as Breitbart News has reported, the McConnell-aligned Senate Leadership Fund Super PAC has pumped millions into the Republican primary to help Strange win. The Moore campaign welcomed Trump’s promise to campaign with them should Moore win on Tuesday.